It’s that time of year: summer and gardening season is in full swing. And with it, comes the weeds. And more weeds. And more weeds. 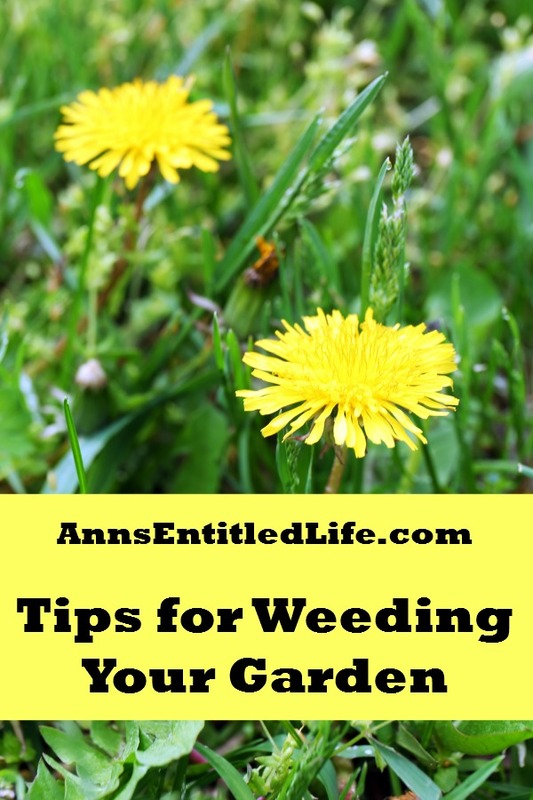 Regardless of how diligent at preventative weed measures, if you have a garden, you will have weeds. The seeds from weeds can lay dormant for years. They are out there, just waiting to spring up one night! I’d love to tell you that you can have a weed-free garden, but unless you have a full-time gardening staff, that is unlikely. Strive to keep your garden relatively weed free. Not only will your neighbors be happy with that, so will your plants. Remember, weeds can take over a garden, encroaching on your beautiful flowers, vegetables and herbs. With the end result of keeping your plants happy, here are some tips for weeding your garden. • Mulch is your friend. A good layer of gardening mulch can help keep those weeds from sprouting. Keep your mulch about 2″ deep the entire gardening season. This may mean adding mulch if it washes away. Mulch works to suppress weeds by limiting the amount of sunlight on your dirt; sunlight is necessary for weeds to become established. Mulching also can help retain soil moisture, reduce soil temperature and improve the soil. • Preen when used correctly, is an effective weed preventer. Preen Weed Preventer stops weeds from germinating in flower and vegetable gardens, in ground covers and around trees and shrubs. Preen will not kill existing weeds. It will prevent new weeds from sprouting — eliminating the need for difficult and time‑consuming hand‑weeding. • Protect your back and knees Get a good gardening kneeler or a garden scooter. Sitting to weed or kneeing on a soft pad is definitely better than bending over and straining your back. • Invest in some stepping stone. Then, you won’t squish and compact the soil when walking through the garden to get those weeds (or clip the flowers or harvest your vegetables and herbs). • Invest in the correct weeding tools: an old kitchen knife, spoon or fork are not the correct tools – and I say this as someone whose mother kept an old knife handy in the milk box for weeding, and that I used many times growing up. Get a hand weeder a hoe or hand cultivator to get to the root of the weed before removing it. • “Pull when wet, hoe when dry” – in other words, weed when the soil is damp. Yeah it can be messy on the gardening gloves, but weeds come out much easier when the soil is moist as opposed to dry. • Weed often – daily if possible. Yeah, yeah, easier said than done. Still, it is much better on the back, knees and garden (younger weeds are easier to remove) if you can weed 15-30 minutes a day, and keep the weeds under control, rather than once a month for an entire day. • Don’t shake the weed to remove dirt.I understand you want to put the dirt back in the garden, but if you shake that weed to remove soil, the seeds (up to 200,000 per weed!) will become airborne giving you more weeds in a few days, weeks, months, even years down the road. Weed seeds are the “gift” that keep on giving. 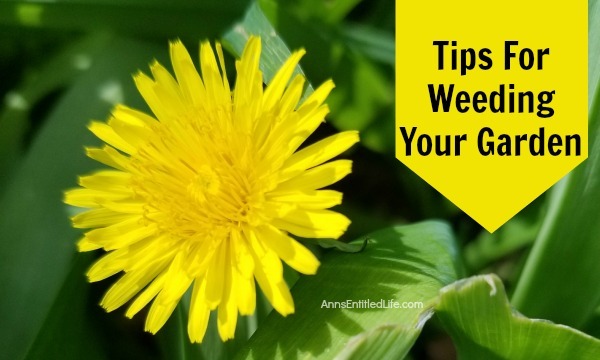 • For weeds growing between cracks in driveways, walkways or around decks try pouring boiling water or vinegar over them if you don’t want to use a commercial herbicide. You made need to repeat the process a few times before the boiling water or vinegar finally kills those weeds. • Dispose of the weeds promptly to a compost heap (if warm enough) or curbside recycling pick-up. This will prevent their seeds from dropping giving you more weeds. We use the brown bags here for our garden recycling, and the bags help contain the garden debris when you fold the top of the bag down. • Hire help. Seriously. I enjoy a (nearly) weed-free garden as much as the next person and I am not very fond of weeding myself. A lot of people aren’t. Hiring out the weeding to a landscaping company can be money well spent for many people with gardens, either due to age, infirmary, allergies or any desire to weed themselves. What are your tips for weeding your garden? Disclosure: the links in this post may contain affiliate links. Mulch mulch mulch…. Its my favorite weed barrier. Once upon a time, I used to go up & down the streets in town & picked up their bags of grass on the weekends.. I’d come home & dump it in my veggie garden making sure to keep it at least 3-4″ from any plants and my hot North Texas sandy soil was always moist, cool and weed free. I keep saying Im going to do it this year but I havent managed to do so yet… but I will. 😉 Or I’ll go find some hay to spread on it instead. We’ll see. Those are my favorite ways to deal with weeds.